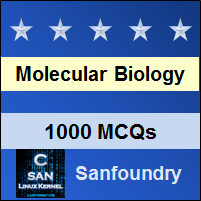 This set of Molecular Biology Multiple Choice Questions & Answers (MCQs) focuses on “Proteins are Chains of Amino Acids”. i. Recognition and attachment of correct amino acid depends on aminoacyl tRNA synthetase. ii. Transfer of amino acid to the polypeptide chain. Explanation: Recognition and attachment of correct amino acid is the primary role of aminoacyl tRNA synthetase and requires the identification of anticodon on the tRNA to attach the correct amino acid. This aminoacyl tRNA now transfers the amino acid attached to it to the elongating polypeptide chain by recognizing the codon on the mRNA during translation. Explanation: The tRNA molecules to which amino acids are attached are said to be charged. Charging requires an acyl linkage between the carboxyl group of the amino acid and 2’ or 3’ hydroxyl group of the adenosine nucleotide that protrude from the acceptor stem. 3. The formation of the acyl linkage is significant for protein synthesis even though it is a high energy bond. Explanation: Acyl linkage is formed due to hydrolysis which results in the change in free energy. This is significant for protein synthesis: the energy released when the bond is broken helps drive the formation of the peptide bonds that links amino acids to each other in polypeptide chain. 4. The joining of the amino acid to the tRNA requires ___________ steps. Explanation: All aminoacyl tRNA synthetases attach amino acids to the tRNA in two enzymatic steps. Step 1: adenylation in which the amino acid reacts with ATP to become adenylated. Step 2 is tRNA charging in which the adenylated amino acid reacts with the tRNA while bound to the tRNA synthetases. Explanation: The principle driving force for adenylation reaction is the subsequent hydrolysis of pyrophosphate by pyrophosphatases. As a result of adenylation, the amino acid is attached to adenylic acid via a high energy ester bond in which in which the carbonyl group of the amino acid is joined to the phosphoryl group of the AMP. 6. How many types of tRNA synthetases are found? Explanation: There are two classes of tRNA synthetases. Class I enzymes attach the amino acid to the 2’ – OH of the tRNA and are generally monomeric. Class II enzymes attach the amino acid to the 3’ – OH of the tRNA and are generally dimeric or tetrameric. 7. How many tRNA synthetases are found in a cell? Explanation: Each 20 amino acids are attached to the appropriate tRNA by a single, dedicated tRNA synthetase. Because most amino acid are identified by more than one codon, it is not uncommon for one synthetase to identify and charge more than one tRNA. Thus, only one tRNA synthetase is responsible for charging all tRNAs for a particular amino acid. 8. The quaternary structure of which of the aminoacyl tRNA synthetase is the odd one among the following? Explanation: The quaternary structure of the aminoacyl tRNA synthetase of Alanine, Proline and Serine are monomeric. Glycine has a dimeric aminoacyl tRNA synthetase molecule. 9. Which of the following pair is an example for using only one type of tRNA synthetase in bacteria? Explanation: Some bacteria lack a synthetase for charging the tRNA for glutamine (tRNAGln) with its cognate amino acid. Instead, a single species of aminoacyl tRNA synthetases charges tRNAGln (glutamic acid) as well as tRNAGlu. 10. Which of the following parts of the mRNA determines the specificity of the amino acid attached? Explanation: Genetic, biochemical and X-ray crystallographic evidence indicate that the specificity determinants are clustered at the two distant sites on the molecule. They are the acceptor stem and the anticodon loop. 11. Any mutation in the sequence of the acceptor stem does not pose a threat to the amino acid incorporation. Explanation: The acceptor stem is an especially important determinant for the specifically of tRNA synthetase recognition. In some cases changing a single base pair in the acceptor stem is sufficient to convert the recognition specificity of a tRNA from one synthetase to another. 12. For the addition of amino acids to the tRNA molecules the tRNA synthetases rely on the guidance provided by the anticodon sequence. Explanation: For the addition of amino acids to the tRNA molecules by the tRNA synthetases, guidance provided by the anticodon sequence is not enough for the specificity as amino acids are usually specified by more than one codon. Thus to recognize the specific tRNAs, the synthetases for that amino acid must rely on determinants that lie outside of the anticodon. Explanation: The set of tRNA determinants that enable synthetases to discriminate among tRNAs are called second genetic code because of its central importance in information flow. This genetic code is significantly more complex than the first genetic code and cannot be readily tabulated. Without such a code, synthetases could not distinguish one tRNA from another, and the translation machinery would not produce polypeptides with a reproducible sequence.